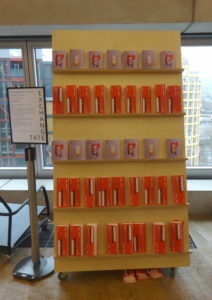 Tate Modern runs an annual programme called the Tate Exchange. 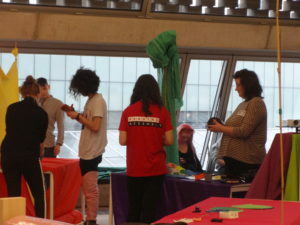 Tate invites universities to run workshops in the Tate Exchange area for a week long programme. The theme for Tate Exchange 2018 was production. 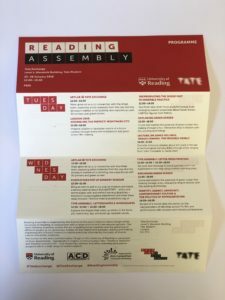 This year was the first year the University of Reading participated in Tate Exchange, therefore previous examples of logos and leaflets that other colleges/universities were difficult to find. The stickers were added onto the brief shortly before the deadline. This however was not a problem as the client only wanted a simple sticker with already designed logos and a line with space to write a persons name. As this job began over the Christmas break, the client meeting was organised to be out of term time to allow me more time to design. After the first client meeting, I immediately wrote the restated brief so I could begin designing promptly. It was clear to me early in the project that my planned schedule could not be followed as I hadn’t taken into account both my supervisor and client being on holiday. This taught me to be more realistic and lenient towards schedules to accommodate other people schedules that I was not aware of. Towards the end of the project, I felt the deadline was approaching quickly and although the logo and main design aspects had been confirmed with the client, there was still a lot of detailed typographic work to do to the leaflet. The copy was also later than the scheduled date as individual lecturers had to write a paragraph about what they were doing at the Tate and many of the lecturers missed the deadline. Therefore placeholder text was in the design for longer than expected. This pressure was heightened as all the deliverables had to be seen to Tate for official sign off before printing. The feedback from the Tate sign off however only produced a few minor changes and all deliverables went to print on time and as smoothly as possible. The communication with the client was over email and as the client was university based, we could regularly meet do discuss things in person. Our meetings were thorough and therefore we only met three times whilst completing the project as every meeting I took printed designs and prototypes on different paper for the client to see a mock up of the final design. This made the process go smoother as we covered all the information I needed to complete the next part of the project. If we had missed anything out the client and I were in regular contact to keep each other updated. 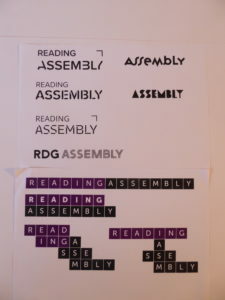 The challenge of this project was following both Tate and University of Reading brand guidelines in conjunction. 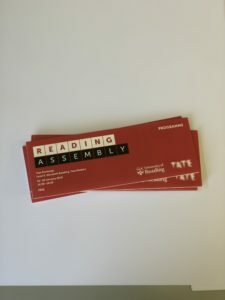 Although the client said it was not essential to use University of reading colour, red, we later decided it would be appropriate to be university branded to look coherent with other leaflets around the university. I did test and show the client designs in blue, purple red and green before this decision was made. I believe the red was the most successful design as it is bold and the t-shirts the helpers wore whilst at exhibition were also red to be consistent and therefore stood out for any visitors to find them. During this project I learnt the importance of working closely with detailed typography from the beginning of the project as even with placeholder text, the detail could be experimented with. The use of the placeholder text, used as suggested by my supervisor, meant the typography of the leaflet developed much more than it would of otherwise as I had more time with the text. This project also taught me how hierarchy can be shown in typography by changing many different elements, such as colour, size, spacing and weights. I had a week to experiment with this and as a result I feel the hierarchy is successful. 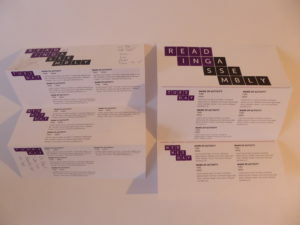 Once the final copy had been sent through, there were challenges with the spacing between sections on the leaflets as due to the folds, the text had to fit within tight margins. To accommodate the final text that replaced the placeholder text, a few minor changes had to be made to the spacing and leading of text. I learnt how to professionally communicate and suggest things to the client that may contradict what they had planned to make them understand the benefits of a design I had created. Thankfully the clients were very trusting in me and encouraged me to experiment with designs. 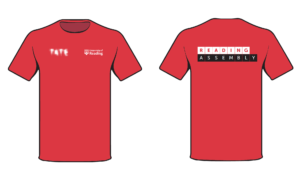 To create the t-shirt designs there was a lot of trial and error as I was unsure how large the logos need to be both on the front and the back. I had done research online however there were no helpful guidelines, instead I printed off each logo in many different sizes and pinned them to a t-shirt to test the sizing and spacing. I could then match the size on the digital file so I was sure it was the correct size to send for print. There was very positive feedback throughout this project from both the client and peers that have used the leaflet and the other deliverables. The clients said the finished items were excellent and set exactly the right tone for what they were trying to achieve during the exhibition. The programme manager of Tate Exchange stated to my client that the overall branding design and the leaflets were cohesive with what they were doing at the Tate and they looked very professional even when placed with Tate’s leaflets in the foyer. This project was enjoyable for me as it was a job for a real client and I had full control of designs and communication directly with the client. The timescale was shorter than what I am used to however this was good practise and gave me an indication of how quickly jobs are expected to be done after university. When I first took on this project I thought I would not be able to meet the deadline however it has taught me that I overestimate the time I take to do designs and that is was possible and the quality wasn’t affected.